A new version of the iconic Nokia 8110 with 4G internet was launched on Sunday. HMD Global, a start-up made of ex-Nokia executives, in 2016 acquired the intellectual property rights required to make phones from Nokia. These included branding and technology. Last year, HMD launched a remake of the Nokia 3310 and a portfolio of smartphones. 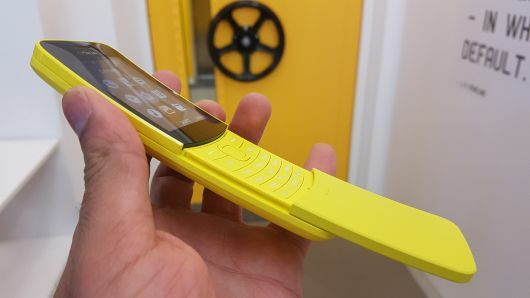 Its latest remake is the Nokia 8110, which debuted at Mobile World Congress (MWC) in Barcelona, Spain. There’s a black and yellow version and it can connect to 4G internet. It has a slider that is similar to the one on the original feature phone. The 8110 will run an operating system known as Kai OS. Florian Seiche, CEO of HMD global, told CNBC ahead of the launch that the company is working with Google and Facebook to bring apps to the device, which will be available from May and cost 79 euros ($97).